With coming of IKE, the first sword, and the world in panic, the Judgment of God is made known to America and is evident to the world. Thousands of people lost everything they have including around three billion dollars in damage and thousands missing and dead. IKE went all the way up through the heartland and touched the great lakes, which is another sign for the great lakes when it spills over on the land and America is split with a whole new ocean way call the sea of the Great Lakes. Chuck Youngbrandt’s Dramatic And Detailed Prophetic 1973 Vision Of The Aftermath. There are hundreds of gas stations with gas shortages as panic and fear have gone through out the land with food and water shortages. It was stated in the watchman reports that the stock markets where going to take a deep dive and days before the fall the Lord God had me to declare the fall of the markets on the Judgment At The Door Radio program. A national shaking will take place. It will be so big that it will cause international attention. this. (See Prophetic Voices of Shiloh #2 May, 1997) The main shaking is on its way. (See Watchman Report #12, Explosions, September 9, 2007 and Urgent #5, Pending Judgment, Feb. 21, 2008). markets took a massive crash. People where throwing their gold into the streets and could not buy even a loaf of bread. “This is how it will be for America very soon; you won’t be able to buy a loaf of bread. America, you refuse to love the truth and you have given yourself over to Idols. Woe unto you; your hour of darkness has now come to overtake you. I will not turn back my sword from your land or your people. To my Church, I call you to Repent and prepare for the death on the land for it will be a day of darkness and many will grow weak and die. I say to my Bride, get ready, for I have called you to rule with the Rod of Iron as it states in Psalms 2:7-9; “I will declare the decree: The Lord has said to me, You are my Son, today I have begotten you. Ask of Me, and I will give you the nations for your inheritance, and the ends of the earth for your possession. You shall break them with the rod of iron; You shall dash them to pieces like a potter’s vessel”. a mountain. I say, double Judgment to the Church, double Judgment to America, double judgment to Washington D.C., double judgment to all the politicians and to the President of America. 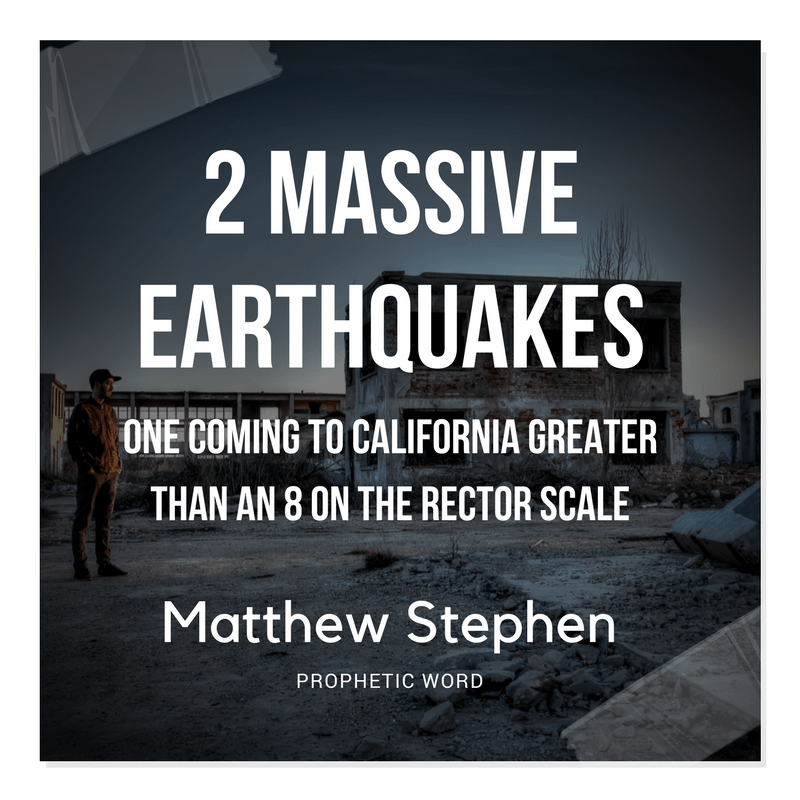 I am about to send upon you two massive earthquakes and one earth earthquake is about to take place very soon. Tell California I am about to remove their candle stick and they will have a very large earthquake. I will send a number of completion upon you I heard the Lord say greater than 8 on the rector scale”. to its very core. I will send a double Judgment on two political leaders and a double hit will soon take place in America, a double hit in Europe, a double hit in the Middle East and the world will run in fear and panic”. America will see a series of hundreds of tornadoes and I saw two huge tornadoes the size of cities. The Stock markets will ripple like a roller coaster and as it slides up and down they will say happy days, eat drink and be married. Then the Lord said, “I will send a crash on your markets and it will soon make a major crash. I will take the wealth of America and burn it up in one hour. The markets are out of control and in one day I will send dilution upon the land. Your food and water supplies will disappear and famine will be in your land. Your waterways and crops are drying up. I will soon send many more hurricanes on the land and when I send Omar upon you it will come to the east and it will be the second sword. I will cause men to hear my voice and make them see my raging arm coming down out of the heavens. the Church and now it will be in the land of America. the time is now here. The increase of this war will be evident to all very soon. We have been in Jacob’s trouble – a great tribulation. We must repent and come into the places of refuge. Jesus Christ is our ultimate refuge. There is “the Church” then there is the “real Church” which is the elect of Jesus that will come out from among them and do mighty exploits. The earth will tremble at the site of the sons of God. Tell my people I love them and trust in me.